Want to become the next Seamless, Instacart, Chef'd, BeyondMenu, Postmates or Eat24 and take a plunge into the $5300 billion industry that employs close to 1.46 billion people on the planet? If yes, there can't be a better time than this. As smartphones and Internet make their way to every nook and cranny of the world, the opportunity is only set to go bigger. This is the world's largest industry in terms of revenue, employment and consumer base (7.4 billion). Don't get surprised, I have quoted the world's population as none can do without it. To tap the market, all that you need is to have the right food delivery app so that consumers can connect with you seamlessly and get their orders processed and delivered the way they want, where they want and when they want. Here is what consumers expect from your food delivery app, which is nothing but the face of your business for them. Simplicity has no alternative. Make it utterly simple for a user to browse through what you have in the store, place order that drives his or her appetite, make payment and get it delivered right at his or her comfort at the right time. Luckily, mobile app developers today have access to a good deal of APIs, plugins, and other features that can help them improve the accessibility of an app. For instance, an iOS developer can make use of Siri to allow users to control the app with their voice. Messages and Maps have also got an extension. Being on the Maps, they can find not just eateries or restaurants in their area but also the right food delivery app that can help them procure food items of their interests. Congrats, if you stayed true to their expectations! Now the word of mouth can do more wonder than you would have ever thought. Through Messages, customers can share the goodness of the food, not in boring texts and images, but in an animated and stylish way that will appeal to the recipient. Android is also next to none. In the recently released Android 7.0 Nougat, users can be more expressive than ever. They can use two or more languages at the same time while messaging. 72 new emojis have boarded the fleet to make communication more personal and vibrant. Nothing can compare to the pleasure gained with a mouthwatering cuisine. And, if you were actually hungry, the level of satisfaction would know no bounds. Remember, a customer is no different. Hence, Offer an optimised food delivery app that loads faster, responds quicker to his or her action, connects better with backend systems and provides information that the user wants within the blink of an eye. Kitchen and couriers are important attributes contributing to the success of a food delivery app. Here the role of your mobile app developer or company is quintessential. A better synchronisation with them will help you to speed up the delivery process, identify obstacles and stay future ready. Remember, consumers are impatient. 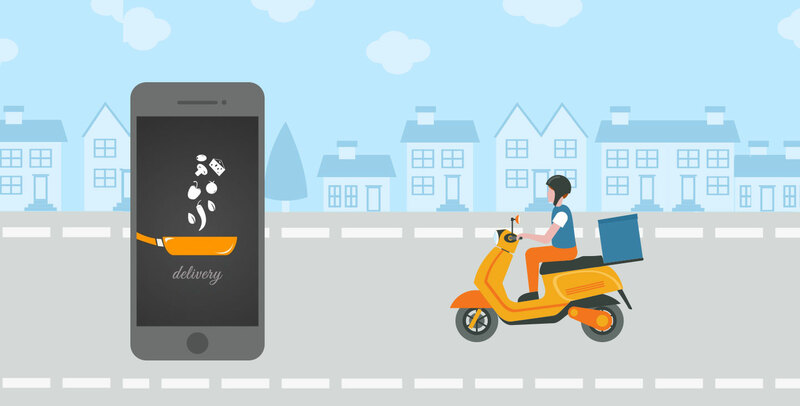 Hence, do make sure that the food delivery app facilitates a delivery tracker that makes no mistake or delay in offering real-time information telling consumers how long would the order take to reach them. This is only possible if the courier services are in sync. If a bank can offer the customised loan, a software company, a customised application, why can't you offer a customised experience or treat to your customer. Personalization is no more confined to any sector. It has become a way to differentiate, no matter what you do. How your users access your app, what they access the most, what kind of order they place, what is their preferred mode of payment and delivery location, occasion, and much more, keep a track on all using a competent analytics tool and, accordingly, modify your app, food, marketing and delivery process to improve their experience with your brand. Consumers, particularly, those unsatisfied can be the greatest source of learning for you and everyone associated with the business. Don't underestimate the ratings and reviews offered by them across any review portals or app stores. Decode ones that are less direct. Bring them to the notice of your mobile app developer, if they are technical. From the rest, take a lesson to improve the way you work, the food you offer and the overall experience they get. Hope you enjoyed reading! Add more to the list that you think can improve the customer experience. To get an appetizing food delivery app built for your restaurant or supply chain, contact Root Info Solutions. We can also add fuel to your existing food delivery application by revamping its user experience. How to Integrate Instagram In Mobile Application to Attract Traffic? How The Blockchain-powered Donations Ensure Trust for NGO Organisation?